Licensed, accredited, and complete with the latest and most-trusted wire rope specifications, Silver State Wire Rope and Rigging, Inc. has your industry covered and protected for any job. Our wire rope and rigging services are thoroughly inspected and authorized in Nevada and California. Whatever your wire rope and rigging needs are, we have a comprehensive solution you can trust. Our professionally designed and manufactured wire rope and rigging services work for hoisting assemblies and below the hook devices. We also offer specialty services for different types of wire rope. Our quality-controlled rigging processes are a great fit for a variety of industries. Las Vegas is known for its entertainment scene, but making safety a priority is important before the show goes on. Silver State Wire Rope and Rigging, Inc. can bring any show or event to life with our professional and safety-first wire rope services. 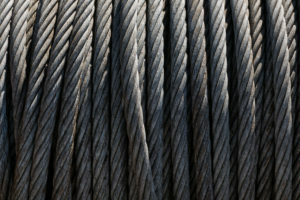 Every job site in the utility industry is different and unique from the last one, and each job could require a different type of wire rope to get the project done safely and cost-efficiently. We design our wire rope to your job’s requirements for any type and size of a work site. Silver State Wire Rope and Rigging is a certified OSHA rigging training company, and we have accreditations in Nevada and California. Our training services are always ready to adjust to new OSHA standards for wire rope, rigging, and any other services we offer your business. Best of all, our training services extend to each of the industries with whom we work. Contact us to learn more about our wire rope and rigging solutions. Get the support and expertise to complete your project from Silver State Wire Rope & Rigging.